The Greek Dancing Ensemble ELLINIKOI XOROI of the Students’ Culture House from Cluj-Napoca was founded and it’s still managed by the choreographer Patricia Presecan who creates both pan-hellenistical dances, known worldwide, as well as dances that specific to each etno-folkloric areas, traditional Greek dances. Established in 2014 it enters quickly into the Greek’s public attention with “SIRTAKI, SEARĂ GRECEASCĂ ŞI PARTY”, a special moment both on stage and outside. The Greek Dancing Ensemble ELLINIKOI XOROI is an ensemble of Greek dancers which preserves and promotes Greece’s wonderful tradition. Dancing is one of the most archaic ways of expressing emotions, the word dace- horo comes from the word- hara which means joy and their dances, as the partners hold hands, make the ties between those who dance, special. 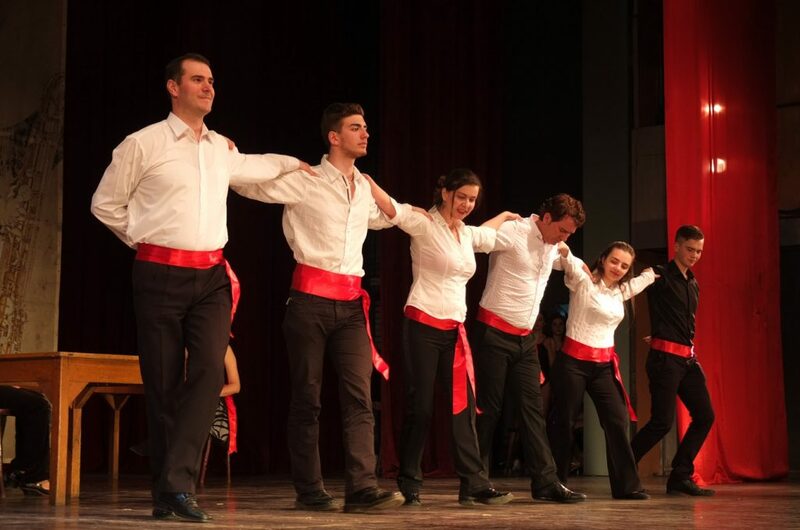 The Greek Dancing Ensemble ELLINIKOI XOROI of the Students’ Culture House from Cluj-Napoca also provides with studying programs for both dancers and non-dancers in the studios from the Students’ Culture House in Cluj-Napoca, Romania. The first specific pan-hellenic dance is Syrtos, danced through the entire Greece, Ο χορός του Ζαλόγγου kai ΜΑΝΑ ΜΟΥ ΤΑ ΚΛΕΦΤΟΠΟΥΛΑ. It continues with Tsamikos which first appeared in Epir, then it spread all over Greece. Initially it was a dance for males, being executed by soldiers before a battle. ΠΑΙΔΙΑ ΤΗΣ ΣΑΜΑΡΙΝΑΣ Apoi Hassapiko, a dance whose origins are in Constantinople and which during the Byzantine area was called MAKELLARIKOS HOROS, is a dance whose choreography is long rehearsed, does not allow other dancers to join. ΜΗΤΣΙΑΣ MITSIAS ” Ο ΔΡΑΓΟΥΜΑΝΟΣ ΤΟΥ ΒΕΖΥΡΗ”, Hasaposerviko, the fast and living variant of the Hassapiko dance- a dance in a row Syrtos sta tria, with a very rare rhythm from the N Greece and with a slow step from Thrace- where Hasapia is a very popular dance. Baidouska is a war-dance which, through its moves, symbolizes the defense technique. Dances from Crete are as follow: Siganos it’s one of the easiest dances and it is performed in an open circle. The fact that the circle does not close it allows people to join and quit without ruining the dance. Pentozali is also a dance from Crete which expressed force and virility. Nisiotika and Balos are two danced that originate from the islands. The one that cannot be missed is the Greek belly dance- Tsifteteli. Zebeikiko is the drunken dace- it is an improvised individual dance where the dancer is surrounded by people who sit in a circle around him. It is rewarded with clapping, flowers and broken plates. The plates are broken in order to break the bad luck. Kalamatiano and Mantilatos are traditional wedding dances performed all over Greece. Hassapiko-Sirtaki is another wedding dance also known under the name Zorba thanks to the movie that made it famous. It’s a dynamic dance where the choreography is long practiced and which doesn’t allow other dancers to join.